 NOTE 1 : Windows XP/2003/Vista/2008/7/8/8.1/2012/10 ! The HOSTS file can be used to block adware, spyware, malware, viruses, trojans, worms + popups in all your ftp/web browsers and internet/network tools by denying access to a list of internet domains/servers/web sites. IF you enable AND try to access them! HOSTS Diagnostic tool courtesy of hpguru [free(ware)]. All HOSTS0.EXE, HOSTS127.EXE + HOSTS.ZIP links below redirect to MDGXHOST.EXE, which installs all these files. C:\Program Files\MDGx HOSTS\HOSTS0.EXE = installs HOSTS with all IPs pointing to 0.0.0.0 = automatic EXE installer. C:\Program Files\MDGx HOSTS\HOSTS127.EXE = installs HOSTS with all IPs pointing to 127.0.0.1 = automatic EXE installer. C:\Program Files\MDGx HOSTS\HOSTS.ZIP [must unZIP all files into same directory/folder] = installs either HOSTS [run HOSTS0.BAT or HOSTS127.BAT] with all IPs pointing to 0.0.0.0 or 127.0.0.1 = manual BATch installers. See further below for complete guidelines: MDGx HOSTS Installers + MDGx HOSTS Archive. Start button → Programs → MDGx HOSTS → click "Uninstall MDGx HOSTS". Start button → Settings → Control Panel → Add/Remove Programs → select "MDGx HOSTS: Uninstall MDGx HOSTS" → click Add/Remove or Uninstall button. MDGXHOST.EXE created with Inno Setup installer tool for all 32-bit Windows (Win32) editions [free open source]. HOSTS0.EXE [700 KB] = all local computer IP entries in this HOSTS file point to 0 (null = 0.0.0.0 abbreviated) [faster]. HOSTS127.EXE [720 KB] = all local computer IP entries in this HOSTS file point to 127.0.0.1 (localhost = loopback) [slower]. You may need to be logged on with Administrative/Power User privileges to be allowed to copy/delete/install/move/rename/replace/uninstall files/folders! %windir% = usually C:\WINDOWS [95/98/ME + 2000/XP/2003/Vista/2008/7/8/8.1/2012/10] or C:\WINNT [NT4/2000]. Your original HOSTS file (if any) will be backed up (renamed) as HOSTS.ORI . Both HOSTS0.EXE + HOSTS127.EXE also install a new URL shortcut to %windir%\HOSTS.HTM, which displays MDGx HOSTS Files, Guides + Tools (this web page). Start button → Programs → MDGx → "MDGx HOSTS Files & Guides & Tools". Start button → Settings → Control Panel → Add/Remove Programs → select "Remove MDGx HOSTS + Restore Original HOSTS" → click Add/Remove or Uninstall button. Both HOSTS0.EXE + HOSTS127.EXE can be opened and their contents can be extracted/viewed using any unZIPping tool that supports the ZIP format [mostly free(ware)]. Both HOSTS0.EXE + HOSTS127.EXE created with MakeSFX.exe ZIP self extractor command line tool for all 32-bit Windows (Win32) editions [free, open source]. Download HOSTS.ZIP [1.3 MB, ZIPped] + extract its files. You need an unZIPping tool to extract files from ZIP archives [mostly free(ware)]. HOSTS0 = all local computer IP entries in this HOSTS file point to 0 (null = 0.0.0.0 abbreviated) [faster]. HOSTS127 = all local computer IP entries in this HOSTS file point to 127.0.0.1 (localhost = loopback) [slower]. %windir% = usually C:\WINDOWS [3.1x/95/98/ME + 2000/XP/2003/Vista/2008/7/8/8.1/2012/10] or C:\WINNT [NT/2000]. Right-click on the one you want in Windows Explorer (%windir%\EXPLORER.EXE), File Manager [FM = %windir%\WINFILE.EXE (Win3.1x/95/98/ME) or %windir%\SYSTEM32\WINFILE.EXE (WinNT/2000/XP/2003/Vista/2008/7/8/8.1/2012/10)] or similar tool → select Rename → type HOSTS (case insensitive = upper case works same as lower case). If using Windows NT4/2000/XP/2003/Vista/2008/7/8/8.1/2012/10 you may also need to copy this new HOSTS file (overwritting the existing one, if any) to %windir%\SYSTEM32\DLLCACHE . Windows 2000/XP/2003/Vista/2008/7/8/8.1/2012/10 users may need to disable System Restore [Windows File Protection (WFP)] or do this BEFORE installing HOSTS. You MUST disable System Restore: open Control Panel → System → System Restore tab → check the "Turn off System Restore on all drives" box → click OK → reboot. To reenable System Restore: open Control Panel → System → System Restore tab → UNcheck the "Turn off System Restore on all drives" box → click OK → reboot. It is recommended to FIRST backup your original HOSTS file (if any). HOSTS.ZIP also contains HOSTS.HTM, which you can run to display MDGx HOSTS Files, Guides + Tools (this web page). HostTool 0.04 Windows DOS console command line tool for Windows 9x/NT4/2000/ME/XP/2003/Vista/2008/7/8/8.1/2012/10 queries all DNS servers listed in HOSTS file, detects + lists invalid ones, highly customizable [32 KB]. Connection IP (CIP) Checker 5.00 SR6 for Windows 9x/NT4/2000/ME/XP/2003 queries all DNS servers listed in HOSTS file and deletes invalid ones [186 KB]. HostTool Windows DOS console command line (see above). CIP Windows GUI (see above). DEDUPE DOS + Windows DOS console command line: removes all duplicate lines in plain text/ASCII files. MSORT DOS + Windows DOS console command line: sorts in descending alphabetical order all lines in plain text/ASCII files. 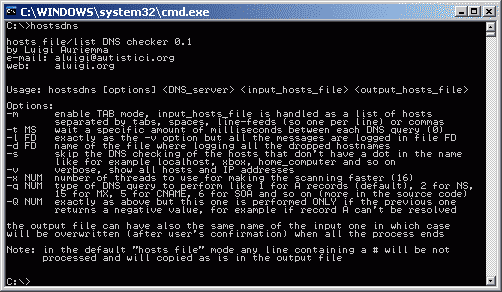 hostsdns 0.1 Windows DOS console command line tool for Windows 9x/NT4/2000/ME/XP/2003/Vista/2008/7/8/8.1/2012/10 HOSTS file DNS hostname checker, supports multi-threading, logging, delay + different query types [18 KB]: hostsdns screen. TextOpus Online Text tools: Delete duplicate lines in plain text/ASCII files. TextOpus Online Text tools: Sort lines in plain text/ASCII files. HOSTS (case insensitive in Windows OSes) or hosts (usually lower case in *nix OSes) is an ASCII (plain text) file used by TCP/IP protocol for BSD/FreeBSD/Linux/Solaris/UNIX, BeOS, MacOS, OS/2, Novell Netware + Windows Operating Systems. Acts as TCP/IP (Transport Control Protocol/Internet Protocol) host table and contains a list of address-to-name resolution mappings of numeric IP (Internet Protocol) addresses (32-bit identifiers) resolved to valid host names. Operates as a local DNS (Domain Naming System) server by translating a UNC (Universal Naming Convention) domain name into an IP address, thus decreasing the time necessary to reach a remote server. MS TechNet: How DNS query works. Never map an IP to a host name already in use, for example your ISP (Internet Service Provider) name or your favorite web site(s) name(s). Never rename this file, it must be HOSTS or hosts without extension. To properly use HOSTS in Windows 32-bit (Win32/x86) + 64-bit (Win64/x64) OSes you must make sure Enable DNS is turned ON: Control Panel → Network → your TCP/IP adapter name (if more than 1 must do this for ALL) → TCP/IP Properties → DNS Configuration tab → check Enable DNS box → click Apply/OK button. Each entry must be kept on its own (separate) line. Entries are almost always case sensitive. Each IP address must be placed 1st separated by at least 1 space or Tab from corresponding host (machine) name, which must be placed 2nd on the same line. If more than 1 localhost lines, the 1st one overrides all others. Each host name entry is limited to a maximum of 255 characters (IPv4). The HOSTS file location can be changed by modifying the "DataBasePath" REG_EXPAND_SZ Registry Value to any other valid location, also described @ MSKB Q314053. According to this Microsoft Windows Vista DNS resolver: deliberately sabotaged hosts file lookup study certain Microsoft owned servers canNOT be blocked by using a HOSTS file in Windows Vista, 2008, 7, 8, 8.1, 2012, 2012 R2 and 10. They seem to be "protected" from being blocked/bypassed ("hard-wired") inside %windir%\SYSTEM32\DNSAPI.DLL [%windir% = usually C:\WINDOWS ; %windir%\SYSWOW64 instead of %windir%\SYSTEM32 on Windows NTx 64-bit (x64) OSes]. And because the DNS Resolving feature canNOT be disabled/bypassed (network + internet access are NOT possible without it), the only way I can think of to "un-protect"/bypass these Microsoft servers is to hex-edit DNSAPI.DLL and delete the "offending" entries. Even so, one must bypass System Restore (SR)/Windows File Protection (WFP) in order to replace the original file with the modded one. An earlier version of this hard-wired list of Microsoft servers is "built" into the Windows XP SP2 + Windows XP SP3 versions of DNSAPI.DLL (Windows XP SP1 and older are not affected), and is designed to send meta + UDP feedback data to Microsoft (for example): how many and what types of media files are opened by Windows Media Player and respectively documents opened by Microsoft Office 2007/newer. The list, which contains over 500 Microsoft servers, can be viewed here. How to disable User Account Control (UAC) in Windows 10. How to disable User Account Control (UAC) in Windows 8/2012/8.1/2012 R2. How to disable User Account Control (UAC) in Windows 7/2008 R2. How to disable User Account Control (UAC) in Windows Vista/2008. How to disable Windows 2000/XP File Protection (System Restore). How to disable Windows Vista File Protection (Zone Information in File Attachments). How to disable Windows 7 File Protection (Zone Information in File Attachments). JS Ware: JSWare and Windows Vista/2008/7 - A Cautionary Note + Warning. Peter Gutmann: A Cost Analysis of Windows Vista Content Protection. In Windows 2000/XP/2003/Vista/2008/7/8/8.1/2012/10 DNS Client service [already started (Automatic) by default on most computers] loads the entire contents of the existing HOSTS file (if any) into the DNS cache, which may slow down the computer, especially if using a (very) large HOSTS file, like mine. One way is to stop and/or disable DNS Client service: Start button → Run... box → type services.msc → click OK or press Enter → open DNS Client → General tab → set to Manual (if needed) or Disabled (if not needed) → Stop (if running) → click OK or press Enter → reboot. To determine if you need to have DNS Client service enabled: Start button → Run... box → type services.msc → click OK or press Enter → open DNS Client → Status column → should state Started (if needed) or should be empty (if not needed). Stop/Disable DNS Client service ONLY if NOT connected to/part of a network/domain or using IPSec (Internet Protocol Security). More info @ MS TechNet. If connected to/part of a network/domain and/or if using IPSec, DNS Client service may be necessary for proper operation. Black Viper: Windows 10 Services Configuration. Black Viper: Windows 8.1 Services Configuration. Black Viper: Windows 8 Services Configuration. Black Viper: Windows 7 SP1 Services Configuration. Black Viper: Windows Vista SP2 Services Configuration. Black Viper: Windows XP SP3 Services Configuration. Black Viper: Windows 2000 SP4+ Services Configuration. The Elder Geek: Windows XP Services Guide. TechSpot: Windows XP Services Tweak Guide. Overclockers Club: Windows XP Services Removal Guide. More info @ MSKB Q314850. In case you are running ANY network/server on your local computer, you MUST edit your HOSTS file using Notepad or better text/ASCII editor/viewer and change ALL 127.0.0.1 entries (except the 127.0.0.1 localhost line) to read 0 (or 0.0.0.0). Restart or log back into your network/server when done. Otherwise you might get a huge number of login popup prompts while trying to access the local server/network, because localhost is always located at the 127.0.0.1 IP address. this may be due to a 0 (0.0.0.0 abbreviated) or 127.0.0.1 entry into your HOSTS file associated with the internet site/server you are trying to access. and then restart your web browser/e-mail client/ftp client/network tool and access that same internet site/server once again. This Web page could not be saved"
this may be due to 1 or more 0 (0.0.0.0 abbreviated) or 127.0.0.1 entry/entries into your HOSTS file associated with 1 or more of the internet site(s)/server(s) you are trying to save that web page from. Copy & paste that URL name from the Internet Explorer URL address box: highlight the entire URL line → right-click on it → select Copy. Close/exit that particular Internet Explorer instance. Rename to any other name or move to any other valid location your HOSTS file. Highlight the entire URL address box → right-click on it → select Paste → press Enter. Now save your web page again. Rename BACK to the original name or move BACK to the original location your HOSTS file. This is because webmasters sometimes include server-side code to access more than 1 web site/server from within the same web page. If you don't understand some of these abbreviations/acronyms/terms, please look them up. PING.EXE is installed by default by all Windows 32-bit (Win32/x86) + 64-bit (Win64/x64) OSes in %windir% [95/98/ME = 9x OSes] or %windir%\SYSTEM32 [NT4/2000/XP/2003/Vista/2008/7/8/8.1/2012/10 = NTx OSes]. by itself to display all available command line parameters. Some internet/network servers use dynamic IP addresses, meaning the numbers change periodically or every time you try to access them. Therefore you may need to ping the same server more than once at different times, and then add ALL IP numbers found for that server, followed by its host/web site name (see example above) on separate lines into your HOSTS file. The HOSTS file is only a primitive anti-adware, anti-spyware, anti-malware + anti-popup blocking tool. But it can be used to successfully block adware, spyware, malware, viruses, trojans, worms, zombies + popups in all your web browsers by preventing an entire list of internet domains/servers/web sites from accessing your local computer(s). Be aware that the HOSTS file can be easily deleted, modified, renamed, moved etc by malware/spyware to include malware/spying/rogue/phishing/virus/trojan/zombie servers or/and to remove/disable malware servers in the background, without user's knowledge. Install + run a dedicated firewall, anti-spyware + anti-virus tools in order to monitor for, detect and remove any potential malware/spyware. denies access to and from microsoft.com domain name. See MDGx HOSTS files for a list of blocked servers. Rename all your HOSTS file 0.0.0.0 (or abbreviated to 0) instances to 127.0.0.1 (or the other way around) if too slow or if not working.